Although about 25% of European farmland is under some sort of agri-environmental contract, these schemes have provided only moderate benefits for biodiversity until now. 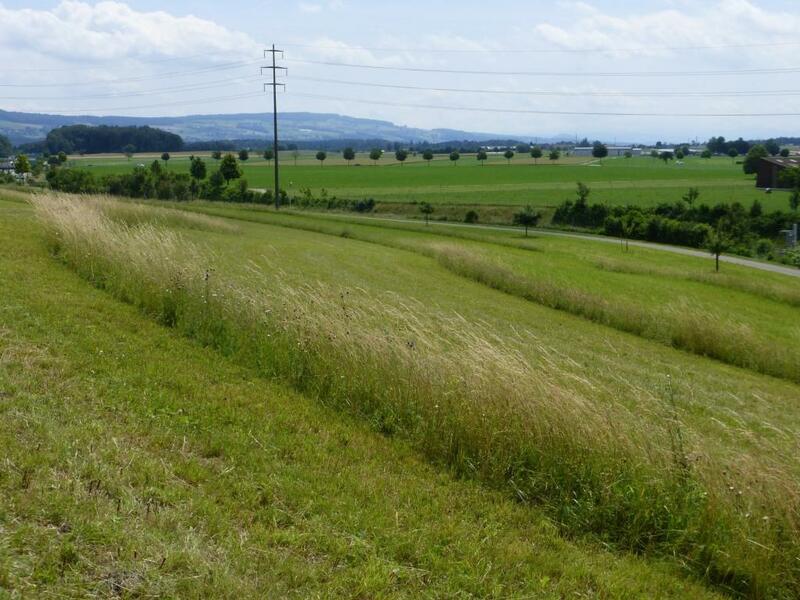 In the Swiss agricultural lowland regions, the greatest biodiversity potential lies within extensively managed meadows, which are by far the main type of biodiversity promotion areas (BPA), equivalent to the European agri-environment schemes (AES). Currently we have two long-term research projects running that investigate experimentally (full-block design with random allocation of treatment to field) and at the field scale alternative management practices (project 1) or active restoration measures (project 2) within extensively managed lowland meadows declared as BPA. Our ultimate objective is to provide end-users, notably farmers and authorities, with easily implementable, evidence-based recommendations for future grassland restoration and management strategies that can improve habitat conditions for farmland biodiversity. In this ongoing project (2010-2021), we experimentally modified the management regime of extensively managed meadows under BPA regulations, so as to increase spatial, temporal, structural and hence ecological heterogeneity. Specifically, we investigate alternative mowing regimes with the main aim to understand how these small management changes can contribute to promote plant and field invertebrate communities. So far results have shown that herbivores, e.g. orthopterans and plant- and leafhoppers, as well as pollinators, e.g. wild bees, hoverflies and butterflies increase in diversity and abundance, sometimes massively, when the first mowing date is delayed by one month (from 15 June to 15 July) or when an uncut grass refuge is left over after mowing operations. Predators like spiders are also favoured by delaying the first possible mowing date. Nevertheless in these lowland meadows the plant communities seem not to benefit from the alternative mowing regimes. This indicates that in fragmented cultivated landscapes, where source populations (ancient grasslands) are rare and isolated, full restoration of grasslands requires measures that go beyond the mere extensification of farming practice that relies on passive restoration. Our hypothesis is that the main factor of recovery is missing: the seed bank or seed input. In this new (2018-2022/26) large-scale restoration research project (60 grassland fields across the Swiss Plateau) we will experimentally evaluate pro-active reseeding methods that rely either on hay transfer from biodiversity-rich meadows, or on locally produced commercial seed mixtures, for pushing poor grassland plant and invertebrate communities towards species-richer stable states. We shall collect baseline data in 2018 (before interventions) and monitor subsequent changes (following reseeding) of various biotic and abiotic components using different metrics on multiple plant and animal taxa (species richness, diversity, functional traits, community analyses, etc.) and hay productivity and quality. Lischer, L. 2016. Effects of altered mowing regimes in extensively managed meadows on ground and rove beetles. Master Thesis. University of Bern. Szikora, T. 2015. Promoting parasitic wasps among Swiss lowland extensively managed meadows: positive effects of delaying mowing and leaving uncut grass refuges. Master Thesis, University of Bern. Bruppacher, L. 2014. Evidence-based mowing recommendations to restore butterfly populations in extensively managed grasslands. Master Thesis, University of Bern.